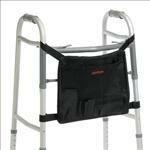 Adult Stand-Assist Walkers; MUST CALL TO ORDER . � Seated users can gradually progress from the lower level of handles to the top level. � Bi-level handles also allow user to position walker over the toilet and use as a toilet safety frame for use in the rest room when away from home.